Do you ever feel socially obligated to eat way more than you would like? Although it is hard, you can ask for half of your restaurant dinner to be wrapped up or tell your friend you would just like half of a piece of cake or half of a sandwich. Today we had lunch with friends. They had bought sandwiches at the local deli. When asked what I wanted, I said turkey with all the vegetables. 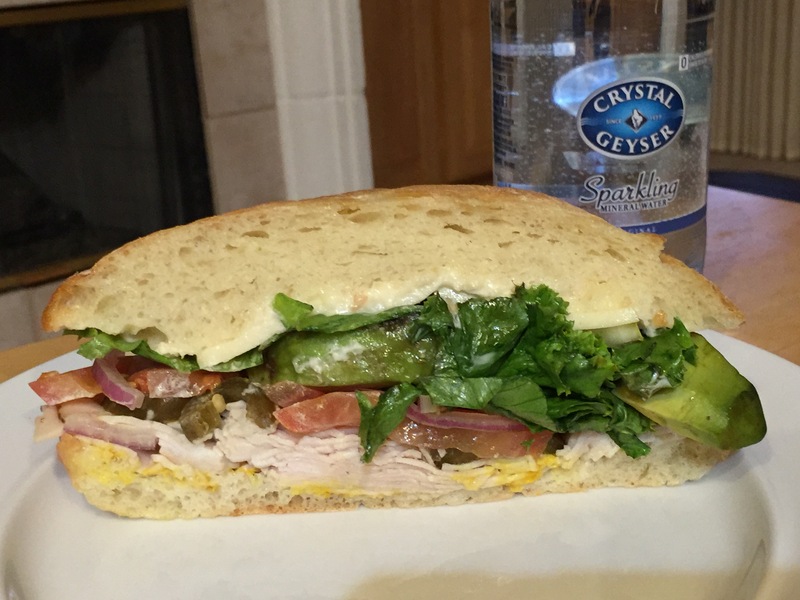 What I got was turkey with the vegetables but also cheese, avocado, plenty of mayonnaise, and a giant ciabatta roll – way too much! I politely ate half. When we were leaving, our sandwich halves were pressed upon us. Quickly changing our dinner plans and emptying out the sandwich innards and some of the roll that I didn’t want, I ate the other half for supper. This entry was posted in leftovers, Poultry, Vegetables and tagged Turkey, turkey sandwich. Bookmark the permalink.